Leaders, stand out. If they didn’t, they wouldn’t be leaders. Leaders need to have a strength of character that goes beyond normal boundaries. A character that’s bigger than life. A character that is not embarassed or fearful, but dynamic and apart from the crowd. Be unique and stand out above the rest by adding a little “flavor flav” to your site. Bad metaphor at attempted humor, but moving on! For those of you who don’t get it don’t worry, just add more flavor to your site. I know Gregg was just joking but this really isn’t a bad metaphor at all. In fact it’s a great metaphor for understanding the mechanics of leadership. The under-the-hood stuff. Flavor Flav is outrageous. He doesn’t make any apologies. 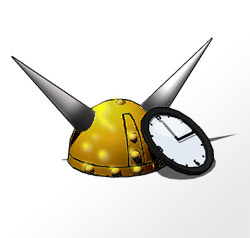 People know him for his music, his tv series, that crazy viking helmet and his ever-present clock pendent. He’s got the kind of character that makes people wonder ‘What’s this guy going to do next’? Leaders don’t follow the crowd. They head off in their own direction. This is something that’s ingrained in them to the core. But … if no one follows, then you’re not a leader at all. You’re just all by yourself. Leaders have electricity. They have magnetic character. This is what draws people towards them when they take off in their own direction. It might be how they look, how they act, what they say; the key is, they make people curious, inspire them, motivate them and compel them to navigate into uncharted territory. To follow the trail they blaze. There are a lot of important character traits that define great leadership, but without the mechanics of leadership, without both these moving parts, it can’t happen. The question has to be asked. Are some billionaires and notable figures eccentric because they can afford to be, or are they successful because they stand apart from the crowd? It’s fair to say that one fuels the other, but the latter is true for the most part. At least when you look at the mechanics of it. The next time you’re building something great. Something that leads the way, make sure to stop and ask “Where’s the Flavor Flav Factor? What makes this bigger than life”? I definitely agree with you on all of your points about a leadeer. I really like how you pointed out that a leader isn’t a leader if no one follows. I always advocate learning by doing. Only by taking the lead and turning around to see there’s no one following can you gain this perspective on leadership. That’s why experience counts for so much. I have successes AND failures. I get a lot from both. And thanks for YOUR post, which inspired this one! Also, I thought it was kind of interesting that you said “Learn by doing.” That’s the motto at Cal Poly. Gregg Hawkins - "Judge One Not By His Charms, But By His Qualities"
I think I definitely possess the first trait of not following the crowd but need to generate more electricity.